Lately, it has become popular to remove lacquer from Brass Instruments. Is this just the latest fad, or are there good musical reasons for doing so. There is an old controversy concerning the finish on brass instruments. 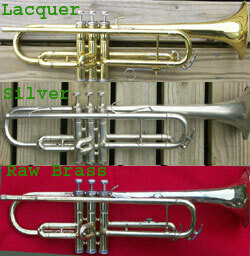 Some prefer a lacquered horn, some prefer a silver-plated horn in either silver or gold, and some prefer raw brass. Renold Schilke, president of the Schilke Company conducted an experiment. He selected three instruments that played identically. Then he silver-plated one, one was lacquered and the third was left in raw brass. He had various Symphony players and professional trumpet players test them and the results were unanimous. They found that plating does not affect the playing qualities of brass instruments. The plated instrument and raw brass instrument still played identically. The lacquered instrument, however, changed considerably. This instrument, which originally had played the same as the other two, now had a very much impaired tonal quality and the over-all pitch was changed. The silver plating on a brass instrument is only one-half of a thousandth inch thick (.0005). Lacquer, however, is approximately seven thousandths of an inch thick, or .007 inch. The lacquer on the bell of an instrument is .007 on the outside AND another .007. Considering that the bells on some instruments are .014, the lacquer doubles the bell's thickness. Originally, brass instruments were ­ brass. (Well mostly; some were German silver.) But, people were not too impressed with the look of brass instruments, and besides — they tarnished. So, to make them appear more to their liking, they discovered that they could silver-plate them and they especially liked the satin silver finish. Some of the really extravagant ones were even gold-plated. The silver still tarnished, but not as quickly as did the raw brass. Also, to enhance the look of the instrument they also did a considerable amount of engraving; logos and designs were added to make the instrument look even more attractive. These horns lovingly made works of art which were sold to professional musicians. Some makers used science and technology . . . and marketing to develop a mass produced inventory and competition developed between the larger makers. They created new markets with amateurs and students, and to remain competitive they had to find ways to make the product less expensively. And, there was also a little thing called the depression that really made the market challenging. Plating was a costly process and the makers found that they could make a horn that looked a bit like a gold plated one by using a tinted lacquer over the brass. The lacquer kept the instrument looking nice longer because it didn't tarnish anymore. So, they looked good longer. But. . . not forever. Eventually, the lacquer wears or chips off. And, when that happens, you can't just shine them up. So, from then on unless you have them re-lacquered, they will look mottled. And, what happens when the horn is damaged? When the horn is dented or a brace pulls loose, or a piece of tubing disconnects then the repairman is called to service it. Most repairs other than very minor repairs require the application of heat. Heat to re-solder disconnected pieces, heat to loosen stuck parts, heat to allow serious dents to be removed without cracking the metal. Unfortunately, heat and lacquer are not good friends. Heat will darken and eventually burn the lacquer off. The repairman's only alternatives are to use a minimum amount of heat and try to avoid damaging the lacquer, or remove the lacquer and try to touch it up afterwards. On the other hand, heat and raw brass or silver-plating get along very well. Repairs done on silverplated or raw brass instruments are more easily and quickly accomplished. For the owner, an unlacquered horn will be cheaper to keep in good condition. However, he/she will either need to become accustomed to the tarnished look or periodically spend some time polishing.